1. 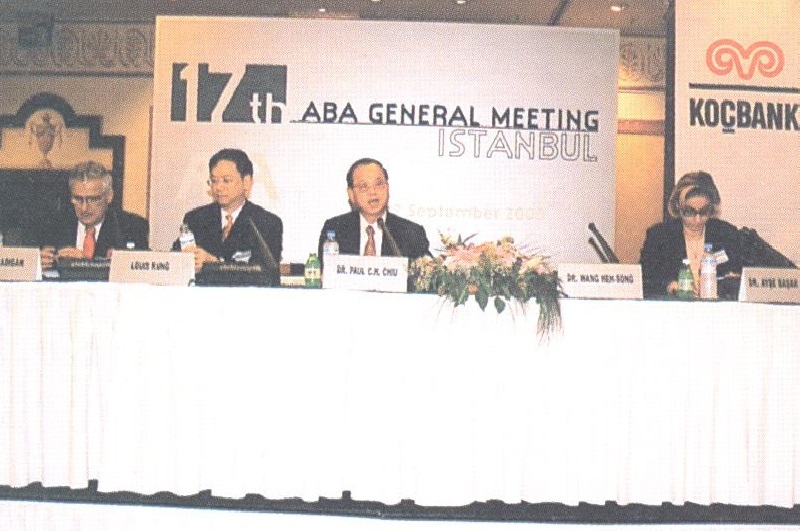 The 17th ABA General Meeting and Seminar was held on 21-22 September 2000 in Istanbul, Turkey. Focusing on the theme ”Banking in the New Millennium,” the two-day meeting was attended by some 100 high-ranking executives of the biggest banking and financial institutions from around 25 countries in the region. 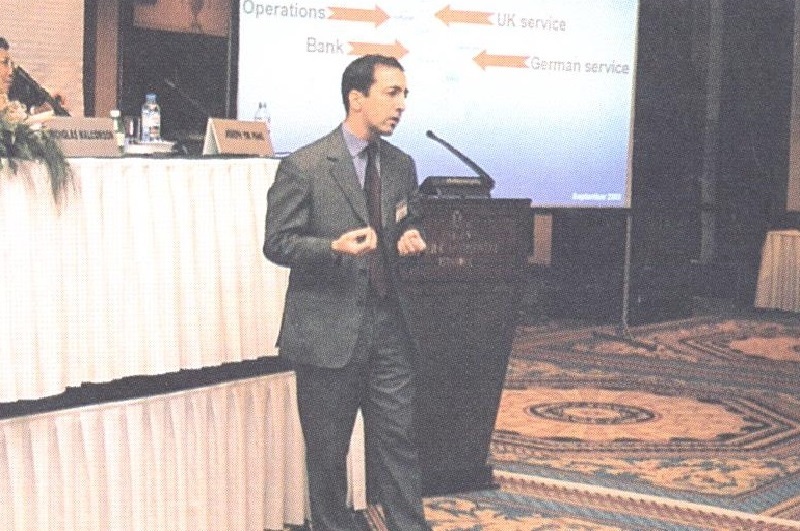 This year’s gathering was hosted by the biggest bank in Turkey, Koçbank. 2. The 28th and 29th Board of Directors’ Meeting, as well as the Advisory Council and the Election Committee meetings, were also held in conjunction with this year’s General Meeting and Seminar. 3. The Istanbul meeting was inaugurated by Governor of the Central Bank of Turkey, Gazi Erçel. In his Keynote Address, Mr. Erçel said that with the advent of globalization and rapid integration of financial markets, what is important for banking systems is not the size but the level of compliance with the internationally accepted rules and standards, and their functionality. He also noted that advances in technology, capital movements and geographical extension of banking business have become the new engines of global integration. The full text of Mr. Erçel’s Keynote Address is attached as Annex 1. 4. In His Welcome Remarks, Koçbank Chairman Burhan Karaçam said the ABA meeting in Istanbul was an important starting point for Asian bankers looking for opportunities in Turkey. He said that although assets of Turkish banks are smaller in comparison with their international peers, they have very strong technology base and offer services no less than those of their multinational competitors. He called on ABA members to establish closer relationship and increased collaboration with their Turkish counterparts. The full text of Mr. Karaçam’s Welcome Remarks is attached as Annex 2. 5. In his Opening Statement, ABA Chairman Datuk Amirsham Aziz said that the future of banking lies in technology. There is, therefore, an urgency for banks, regardless of their size and years of experience, to contemplate change in the way they conduct their business. He also called on banks to be mindful of the possible changes in the regulatory framework as the industry responds to the new banking landscape shaped by technological advancements. The full text of Datuk Amirsham’s Opening Statement is attached as Annex 3. 6. For his part, ABA Founder and Chairman Emeritus Amb. Jeffrey L. S. Koo, in his response to the address of Governor Erçel, cited the significance of holding this year ‘s ABA meeting in Istanbul. He said it is another example of how the process of globalization has allowed bankers from Asia to reach out to their colleagues in places such as Turkey and has given them the opportunity to explore possible areas of cooperation in countries which in the past were considered remote by Asian banks. This, he said, is in line with the primary objective of ABA to provide a forum for networking among bankers not only in the Asia but outside the region as well. The full text of Amb. Koo’s Response is attached as Annex 4. 7. This year’s gathering featured a seminar focusing on the theme ”Banking in the New Millennium.” Experts from different fields spoke on various aspects of the theme with the view to helping delegates obtain a better understanding of the rapidly changing environment of the 21st Century. Leading the speaker line-up was Dr. Paul C. H. Chiu, former Finance Minister of the Republic of China, and currently Chairman of Grand Cathay Securities Corp. Mr. Chiu spoke on the topic ”Regulatory Environment for the Banking Sector in the New Environment.” Other speakers included: Mr. Louis T. Kung, Vice President and General Manager, The Bank of New York, Taipei Branch, who spoke on ”Trends and Challenges for the Banking Sector in the New Millennium”; Mr. Terry Bradigan, Managing Director, Financial Services Asia Pacific, KPMG Consulting, ”Responding to the New Challenges.”; Mr. William E. Smith, Manager for Europe, Middle East & Africa Finance Industry of Microsoft, ”Technology Trends: A Vision of the Future.” and Mr. Nicholas Malcomson, Chief Executive Officer of first-e Asia, whose parent company, first-e, is the largest Internet Bank in Europe and the leading provider of financial services in the world, ”Cyberbanking.” Acting as commentators were Dr. Ayse Basar Bener, Professor, Bosphorous University in Istanbul, and Mr. Joseph Y.W. Pang, Executive Director and Deputy Chief Executive, Bank of East Asia Ltd.
8. The seminar participants noted that a number of fundamental trends are bringing about many challenges for the financial services sector and are expected to shape its future. Among these trends are the revolution in information technology; the changing policy and regulatory framework for the financial sector; the changing face of the financial services industry brought about by mergers and the convergence of banking, insurance and securities businesses; and the entry of new players in the financial services industry. 9. Delegates noted that the responses of banks and financial institutions to the new challenges have taken various forms. One example has been the wave of mergers among banks, as well as between banks and firms in other financial services sector. Another has been the application of new technologies in financial services. The ABA recognized that many factors affect the capability of firms to respond to these challenges, and that the situations for banks and financial institutions vary with respective levels of economic development, culture, market characteristics, and policy and regulatory environments. 10. Seminar participants acknowledged that technology is a fundamental force that is rapidly revolutionizing the economic landscape today. Advances in information technology are changing the way business is being done in all industries, as demonstrated by trends in such sectors as retail trade, manufacturing and the knowledge industries. In the area of banking and finance, new technologies are opening up vast opportunities, but also posing numerous challenges. 11. Seminar participants agreed that the adoption of currently available technologies is crucial for the survival of firms, especially in the competitive banking sector. Particularly, information technology offers many new possibilities for banks to offer both new and traditional services in more effective and efficient ways. They noted that cyberbanking is one of the major trends in the banking industry today. 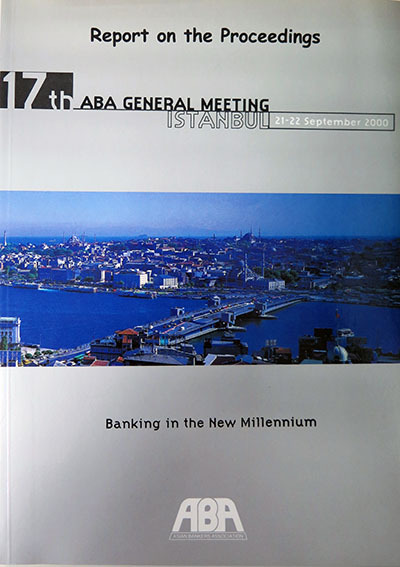 Adoption of Two Position Papers – As part of its continuing efforts to strengthen its role in policy advocacy, ABA adopted two position papers, namely: (i) Comments on the Basel Committee on Banking Supervisions ‘ Consultative Paper ”A New Capital Adequacy Framework”; and (ii) ”Promoting the Development and Integration of Asia’s Bond Markets.” The two papers were subsequently submitted to APEC Business Advisory Council (ABAC) and/or the Basel Committee on Banking Supervisions. Creation of the Task Force on Bond Market Development – The Task Force on Bond Market Development was created to oversee the study on the development of regional credit rating standards. The study covers 11 countries in the region. Continued co-sponsorship of Asia Pacific Bankers Congress (APBC) – ABA once again co-sponsored the APBC 2000 held on held on 25-26 May 2000 in Kuala Lumpur. A total of 62 ABA member banks attended the Congress while 10 member banks won various categories of the Asian Banking Awards. 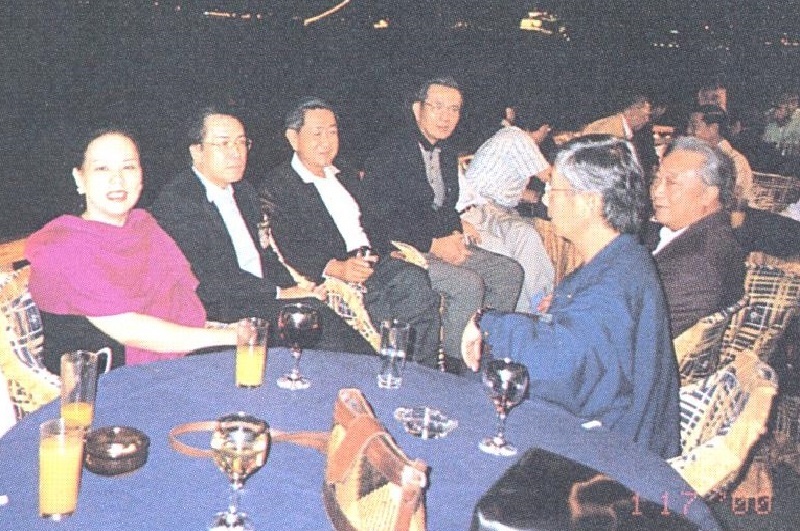 ABA is currently helping make preparations for next year’s Congress to be held in April 2001 in Bangkok. Professional Development Program – ABA is coordinating with the Asian Institute of Ma11agement (AIM) on the ABA-AIM Bank Management Course scheduled on 4-15 December 2000. This year’s offering focuses on ”The Impact of Information Technology (IT) on Banks and Banking.” ABA also endorsed two training programs offered by other organizations: (i) First Asia Cyberforum Summit, to be held on 12-13 October 2000 in Kuala Lumpur, with Lafferty Group; and (ii) IBC ”Sleepless in Asia” Summit, to be held on 3-4 October 2000 in Taipei, with IBC Asia, Ltd.
13. The full text of the Chairman’s Report is attached as Annex 5. 14. 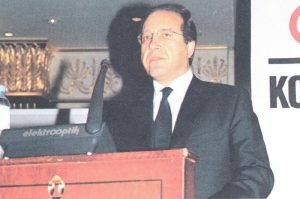 On behalf of the Election Committee Chairman Peter B. Favila, Amb. Jeffrey L. S. Koo presented the names of 24 members qualified to sit on the ABA Board for 2000-2002, based on the results of the canvassing conducted earlier. The General Meeting unanimously elected the 24 nominees. 15. 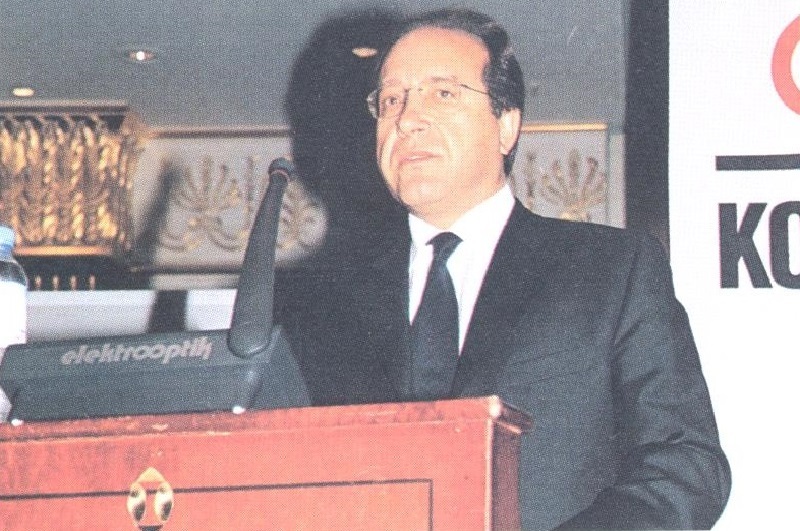 In his Valedictory Address, outgoing chairman Datuk Amirsham said that ABA members can be justifiably proud that notwithstanding the financial crisis of 1997-1999, the Association has exhibited resilience and resoluteness, and emerged as a credible and internationally recognized consultative body. He attributed this to ABA ‘s cooperative spirit and expressed hope that the strong sense of partnership among members will be further strengthened and extended to the new Chairman. The full text of Datuk Amirsham’s Valedictory Address is attached as Annex 6. Per resolution passed during the 28th Board of Directors’ Meeting, a plaque of appreciation was presented to Datuk Amirsham in recognition of his important contribution and distinguished service to ABA during his two-year term as Chairman. 16. Dr. Lee Yung-san was formally sworn in as new Chairman of ABA by Amb. Jeffrey L. S. Koo. In his Acceptance Speech, Dr. Lee called on the ABA to play a pivotal and catalytic role in the region. He said that during his two-year term, he will focus his efforts on activities that will further help the ABA attain its primary objectives of providing a forum for advancing the causes of the banking and finance industry and promoting regional economic cooperation. The full text of Dr. Lee’s Acceptance Speech is attached as Annex 7. Report of the Secretary-Treasurer – The Board approved the Report of the Secretary-Treasurer highlighting the activities of ABA since the 27th Board of Directors’ Meeting held in November 1999 in Singapore. 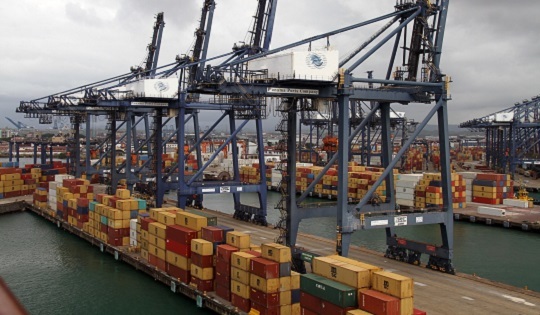 Financial Report – The Board approved the audited Financial Statements for the years ended 1998 and 1999, and noted the unaudited Financial Statement for the period January 1 to June 30, 2000. Membership – The Board ratified the membership application of Asaka Bank of Uzbekistan, agreed to accept the withdrawal of 11 banks, and decided to drop from the membership list 8 delinquent banks. The Board noted that as a result of the foregoing moves, the total number of members had dropped to 122. New Board Members – The Board endorsed the Advisory Council’s proposal to recommend to the regular membership at the General Meeting on September 22 the final election of the 24 qualified nominees. Report of the ABA Task Force on Bond Market Development – The Board approved the Report on the ABA study to develop regional standards for Asian credit rating agencies, as well as the ABA position paper endorsing the recommendations of the study. In this regard, the Board endorsed the proposal to hold a press conference for the purpose of publicizing the results of the study. Professional Development Programme – The Board noted the status on preparations for the Asia-Pacific Bankers Congress 2000 tentatively to be held in April 2001 in Bangkok, and the 7th ABA-AIM Bank Management Course on ”The Impact on Information Technology on Banks and Banking, “to be held on 4-15 December 2000 in Manila. Election of New Officers – The Board formally elected Dr. Lee Yung-san of the International Commercial Bank of China as Chairman and Amb. Alfonso Yuchengco of Rizal Commercial Banking Corp. as Vice Chairman for the term 2000-2002. 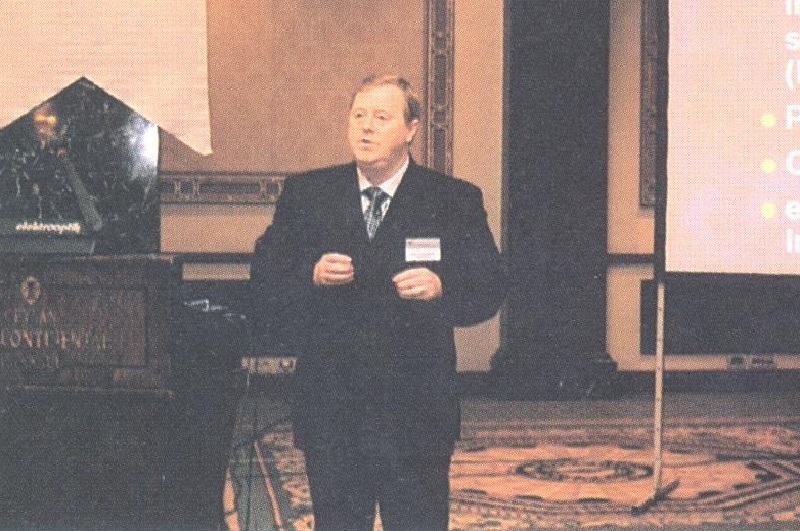 Work Programme for 2000-2002 – The Board approved the Draft Work Programme for 2000-2002, subject to the integration of additional activities recommended by the Advisory Council and member banks. The Board also agreed to form a Planning Committee to flesh out details and finalize the said Work Programme in a meeting to be held in Taipei in early February 2001. Budget for 2001 – The Board approved the proposed Budget for 2001. Date and Venue of the 18th General Meeting – The Board agreed to hold the 18th General Meeting in Tashkent, Uzbekistan next year. The exact dates and venue of the meeting will be determined by the ABA Planning Committee in consultation with the host bank, the National Bank of Uzbekistan.